The Index opened flat to positive and went up to the highs of the day at 8146 but saw huge liquidation to close near the lows at 8065.80, loss of 45.95 points. The broader market was weak, with 485 advances to 1034 declines. The range at the start of the series stays at 8000-8500. Call option 7700-8700 added huge 53.11 lacs OI. Put option 8200-7400 added huge 43.56 lacs OI. 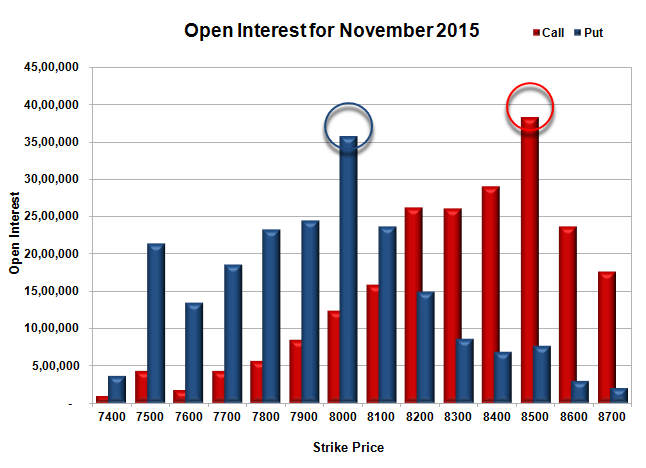 Nifty Open Interest is at 1,87,79,175 up by 9,49,050, with decrease in price, most probably huge short build-up. 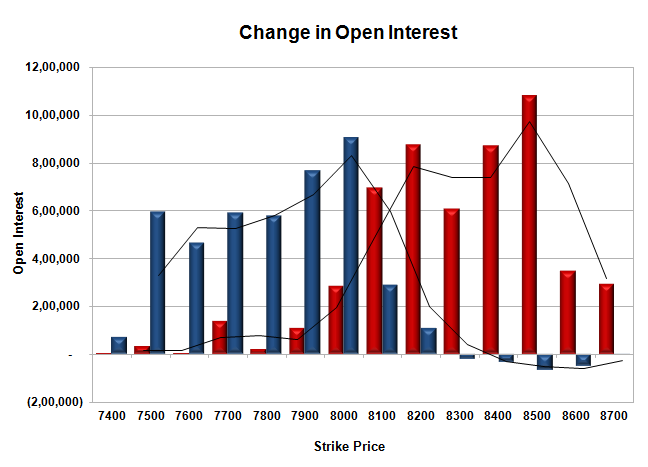 Bank Nifty Open Interest is at 20,50,740 down by 1,40,010, with decrease in price, most probably huge long liquidation. FII’s bought 1.48 lacs Futures, which includes 2385 contracts long build-up and 3546 contracts short covering, with decrease in net OI by 1161 contracts, includes 38599 longs to 32668 shorts for the day. 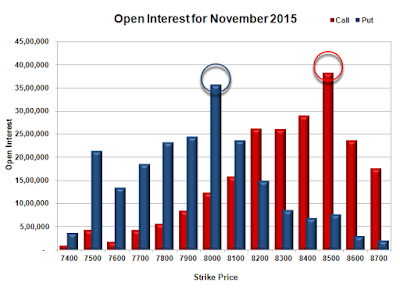 FII’s Index future open contract as on date is 196642 Longs to 88596 Shorts, Net Long 108046 up by 5931 contracts. 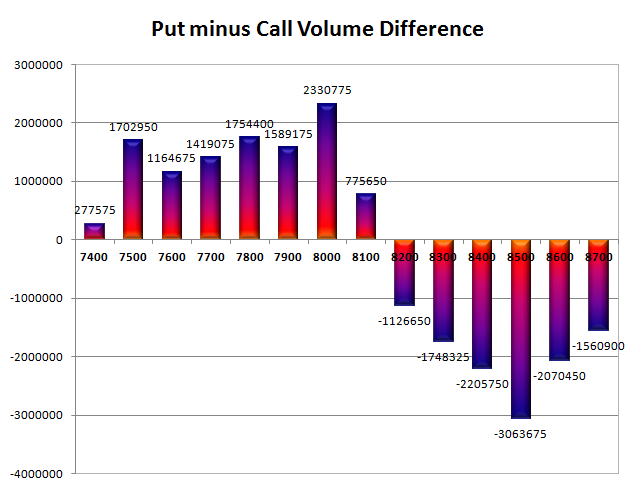 Initial and best support at 8000, with OI of 35.69 lacs and below that at 7900 with OI of 24.42 lacs. 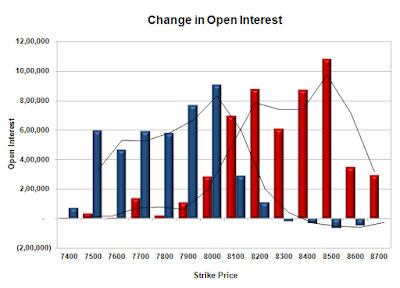 Initial resistance at 8200, with OI of 26.28 lacs and above that at 8300 with OI of 26.13 lacs. 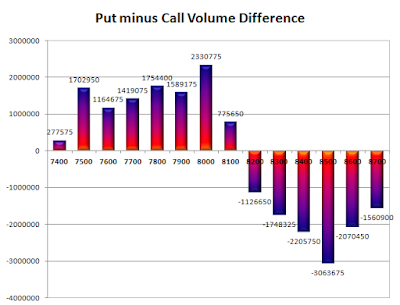 Day Range as per Option Table is 8020 - 8145 and as per VIX is 7992 - 8140 with 8130 as the Pivot.